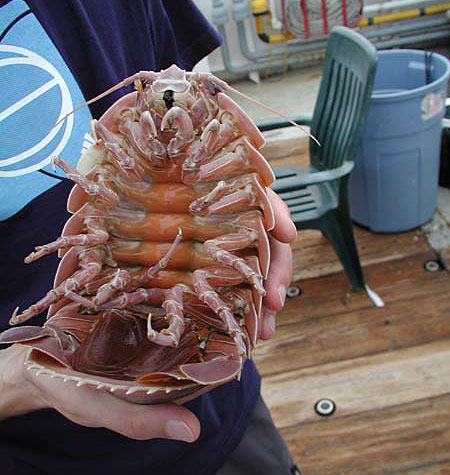 The Giant isopod is a deep sea crustacean living below 2000 m underwater. Known scientifically as Bathynomus giganteus, it is one of about nine members of the genus Bathynomus. It is also the largest known members of the isopod family, a group of crustaceans closely related to shrimps and crabs. Giant isopods are found in most oceans of the world. Their habitat ranges in depth from the dimly lit sublittoral zone at 550 ft (170 m) to the pitch darkness of the bathypelagic zone at 7,020 ft (2,140 m). They prefer mud or clay ocean bottom areas where they prefer to live solitary lives. The enormous size of the giant isopod is a result of a phenomenon known as deep sea gigantism. This is were animals that live deep underwater grow larger than similar species in shallower water, the cause is unknown. Other examples of this would be the giant squid and the giant tube worm. The giant isopod can grow to a length of over 16 inches, which makes it one of the largest members of the crustacean family. Like its terrestrial cousin, the pillbug, the giant isopod's body is protected by a hard shell that is divided into segments. This allows it to be strong and flexible at the same time. When threatened, this animal can roll itself into a ball to protect its vulnerable underside. The giant isopod is a carnivorous crustacean that spends its time scavenging the deep sea floor. Food is extremely scarce at these great depths, so the isopod has adapted to eat what ever happens to fall from above. This includes the bodies of dead whales, fish, and squid. It is believed that the isopod will also feed on some slow-moving animals such as sea cucumbers and sponges. Giant isopods reproduce by laying eggs. These eggs are thought to be the largest of all the marine invertebrates.The females develop a pouch known as a marsupium, where the eggs are stored until the young are ready to emerge. When this happens, the young isopods escape from the marsupium as fully formed miniatures of the adults. At this stage, they are known as manca and are nearly fully developed. Bypassing the larval stage greatly enhances the young isopod's chances of survival. Giant isopods are not usually fished commercially, although some can be found in the occasional oceanside restaurant in northern Taiwan, where they are boiled and served with rice.